People who have a medical record of chronic respiratory conditions, such as sinus infections or allergies have been repeatedly told that certain topical treatments may be more effective than other medical ones. Among the most effective treatments, you can find the use of traditional remedies that had been used for centuries before technology was even a word. Warm steam for example, was a common way to find relief when a bad cold had set in. Similarly, people with persistent coughs or sinus infections used to spend long periods breathing in warm steam vapor, looking for a way to alleviate their symptoms. Vicks has kept a long tradition linked to the treatment of respiratory conditions. Mostly known for its wide array of medical products, such as syrups, cough drops or the well-known vaporub this company has also become popular for producing and commercializing a line of humidifiers. 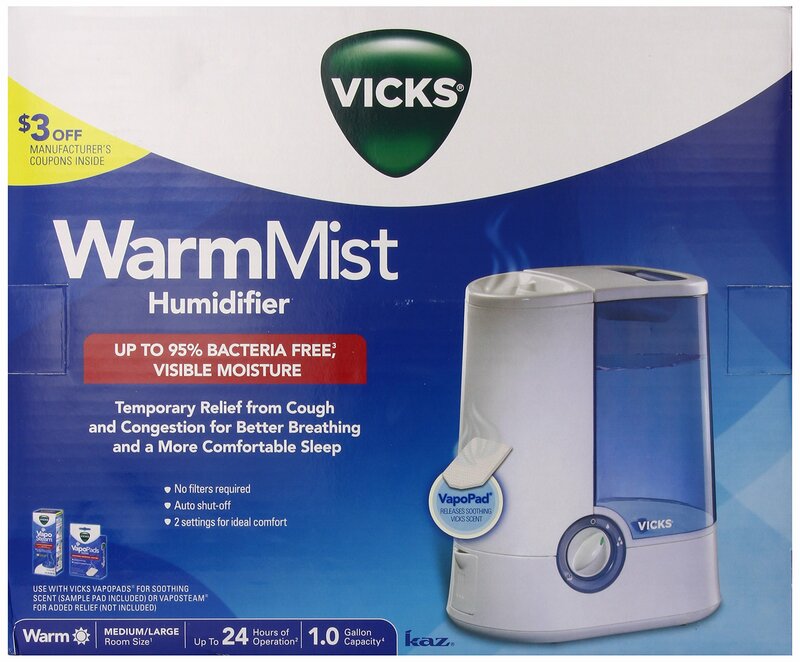 The Vicks Warm Mist Humidifier is a replacement for a previous model called V745. Some conservative shoppers may find it hard to adapt to a new device once they have gotten used to using another one for some time. However, this seems not to be the case with this model which is presented as a practical innovation. Two features account for the product’s optimal performance: sustainability and efficiency. Unlike similar products that have small water containers, this Vicks model allows for longer continuous use thanks to its increased water capacity. Holding 1 gallon, the container in the new model has also been improved in terms of comfort and practical nature. Whereas other models feature small awkward openings that made refilling difficult or inconvenient, the Vicks Warm Mist Humidifier boasts a much larger opening that allows for easy and convenient handling. Because of the large-capacity container, vapor lasts twice as much as it did in the previous model, even when working on the high setting. Similarly, having two different settings is a must, especially for households in which people of all ages and needs live together. By being able to adjust the settings according to each case, users make sure that they are getting the most out of their humidifiers. In addition, the device has been equipped with a scent pad slot in which Vicks Vapo Pads can be placed. Finally, it is because of its increased capacity that this humidifier can last the whole night –even at the highest setting, thereby ensuring the best results. In fact, capacity is large enough to keep the unit working up to 24 hours until next refill. To say that these days, people want comfortable and practical would be an understatement. In times of continuous hassle, user-friendliness and low-maintenance have become valuable assets. This Vicks model fulfills both slots for several reasons. Since it has an automatic shut-off function, users needn’t worry about the reservoir running out of water or leaving the unit on for too many hours. This is a must since the device is so silent that most people have a hard time identifying when the item is working or not. Also, unlike similar models, this unit does not have any filters that need replacement. This feature, apart from being convenient for purely practical reasons, is also good for your budget. When a costly filter must be replaced often, another expense is added to the already long list of the average household. Lastly, cleaning and keeping the unit in good working conditions are also simple with the inclusion of newer technology that prevents the formation of calcium build-up –something that was frequent in the previous model. Let’s take a look at this chart and see how this product compares to similar ones available on the market. Hundreds of people have chosen to share their thoughts on this item rather than keep their opinions to themselves. It is a well-known fact that innovating upon a classic may be a tricky issue: if the customers are not satisfied with the new version, they will keep on asking for the previous one forever. According to many positive reviews, this Vicks humidifier has lived up to its expectations as far as performance and durability are concerned. In fact, most customers agree that all the changes that have been included in the newer version have definitely been for the better: all improving on challenges that the owners of the previous version used to face. The new slot where pads can be placed is also frequently mentioned as a highly positive improvement as well. 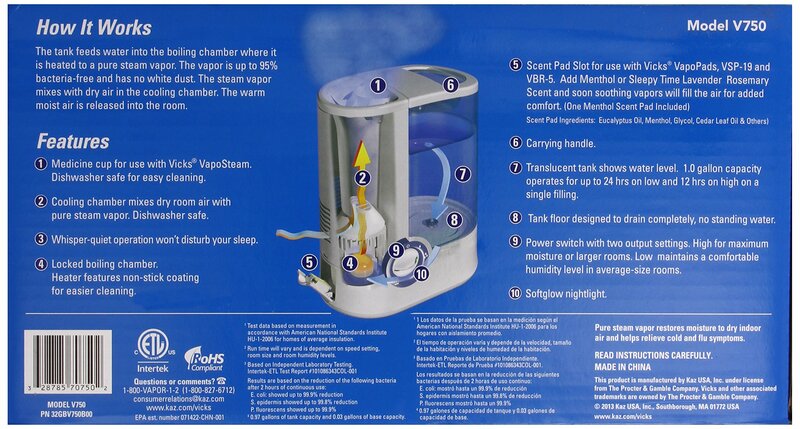 Finally, the fact that this humidifier is much more silent than other available models is also regarded as a major must. After all, sleeping well means no noise to some people. On the other hand, some reviewers have felt annoyed at the unit’s continuous apparent leaking. Some people say that their floors are always wet when they get up in the morning. Even when this affirmation may be true, the dampness found on the floor did not come from leaking, but from the warm steam and its natural condensation. This is particularly so when the device is working on the highest setting. Fortunately, there is a simple way to deal with this matter. Instructions specifically state that users should place a waterproof tray underneath the humidifier. Also, it is wise not to abuse the high setting function otherwise too much humidity may be counterproductive too. In short, it is a practical device to be used when air improvement is the goal.